Sisal can be blocked or hand sculpted. The size of the peak can vary to suit your design ? it can be as long as a visor or offset and squarish. It?s up to you. This workshop will help understand the properties and uses of sisal straw. You will be able to recognise a good quality sisal hood or capeline and learn where to buy quality materials. You will also learn about stiffening sisal as well as the advantages of working with unstiffened straw. We have many patterns for peaks that you will be able to trace off and take home. Choose your own parisisal hood from one of our recommended millinery suppliers and bring your sewing machine skills and your verve! 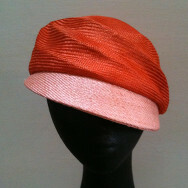 A sisal/parisisal hood or capeline, millinery wire, wire joiners, wadding, plastic for peak insert, Petersham for headfit. Make a smart, trans-seasonal cap to suit your style.